Joule Unlimited promises it can genetically engineer an organism that eats CO2 and produces a drop-in diesel fuel. On Tuesday the company announced that it has landed a patent on its “recombinant biosynthesis” technology, putting it on track to commercialize a feedstock-free process it says can churn out “diesel-range hydrocarbons” for $30 a barrel. U.S. Patent #7,794,969, AKA “Methods and Compositions for the Recombinant Biosynthesis of n-Alkanes,” covers the Cambridge, Mass.-based startup’s process to engineer “photosynthetic microorganisms for the direct synthesis of diesel molecules.” While other biofuel startups are using genetically engineered organisms to convert sugar into drop-in fuels (see Amyris and Solazyme for examples), Joule says its organisms need only sunlight, water and carbon dioxide — a fact that’s key to its low-cost claims. 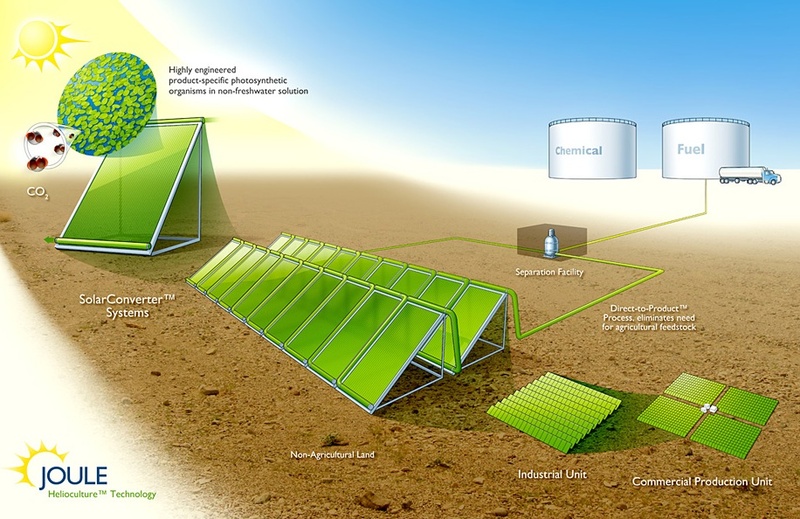 Joule’s “helioculture” systems — glass containers of algae and water laid out in a manner similar to solar panels, with pipes to take the resulting biofuel to storage tanks — are meant to be modular and scalable, CEO Bill Sims told us last year. Unlike many other algae biofuel efforts that rely on harvesting and processing the algae to make fuel or other products, Joule’s microorganisms keep pumping out fuel in a continuous process. Craig Venter’s startup Synthetic Genomics is working on engineering algae to do someting similar, and has a $300 million research project underway with oil giant ExxonMobil. Joule’s pilot project in Leander, Texas is now producing ethanol, rather than diesel, and can produce up to 10,000 gallons per acre per year, though Joule said it’s shooting for 15,000 gallons per acre. As for its diesel product, Joule plans to start pilot production by year’s end and open a commercial plant in 2012. Joule raised a $30 million series B round in April, adding to the “substantially less than $50 million” CEO Bill Sims said the company had raised as of July 2009, when it came out of stealth. The company was founded in 2007 at the Flagship Venture Labs, an arm of Cambridge-based Flagship Ventures. Joule’s claims have been greeted with some skepticism by biofuel industry analysts, no doubt making the new patent — along with another on “Hyperphotosynthetic Organisms” approved on August 31, and Joule’s numerous other patent filings — interesting nighttime reading for its biofuel competitors. Joule’s claim of being able to produce 15,000 gallons of diesel per acre is particularly aggressive. Henrik Scheller, director of cell wall biosynthesis at Lawrence Berkeley National Laboratory’s Joint BioEnergy Institute, has said that algae growing in sunlight can reasonably produce about 4,385 gallons of fuel per acre per year, and that’s by harvesting and processing the algae itself. Joule declined our interview request on Tuesday — we’re curious to hear how the company addresses questions about its high-volume, low-cost claims.